Getting started with WebDriver’s C# bindings in Visual Studio is easy -- if you know how to connect the pieces together. Once the pieces are in place, development is a snap. In this article we’ll show you how to get the various parts and pieces, plus write and run one simple test. For an overview of how WebDriver works, please see the section “WebDriver Overview” in the blogpost “Getting Started with Webdriver/Selenium for Java in Eclipse” here. We expect the reader is using Visual Studio for work. If you don’t have Visual Studio yet, take heart. 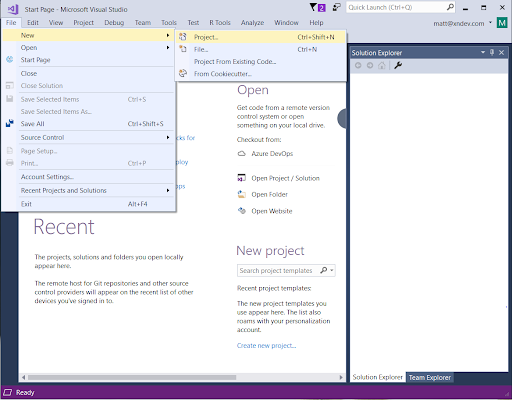 The non-commercial version,Visual Studio Community, is available at no cost. Visual Studio Professional has a modest fee; it is also available on a monthly rental basis.This article uses Visual Studio Community, but you can use exactly the same approach with the Enterprise Edition! For this particular post we’ll skip the mechanics of acquiring and installing due to the wide range of ways to get the product. 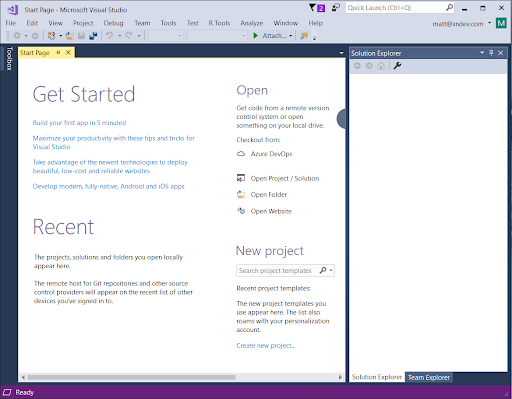 Once you’ve got Visual Studio installed and started, the next step is to create the project to work on. As with all editors and toolsets, there are multiple ways to accomplish the same basic goal of getting a test project built. If you’re working in a team environment, please do your part to maintain sanity and a good team environment: follow the same approach the team uses! Because this is a simple HOWTO guide, we’ll use the simplest approach: A Class Library project. Use File => New => Project. If this is the first time you’ve used this installation of Visual Studio you’ll see a short delay while project templates are constructed. At this point you’ll see the template selection dialog. 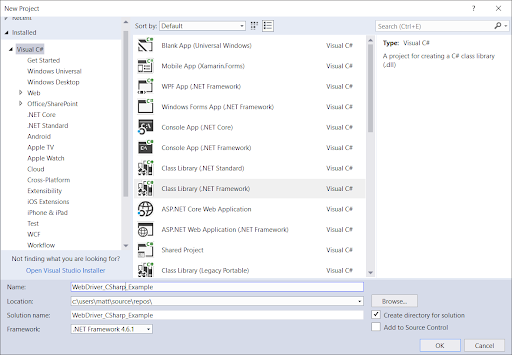 Choose the C# class library (.NET Framework) option. (Discussing the .NET Standard and Core options are beyond the scope of this article.) Give your project a good name and click OK. Visual Studio will create the project and add one class file to it. At this point we need to add WebDriver and our test framework NUnit to the project. 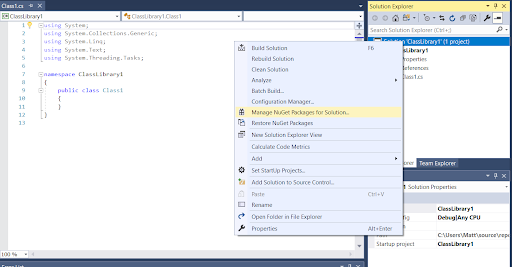 Visual Studio has a great built in dependency management tool called NuGet. 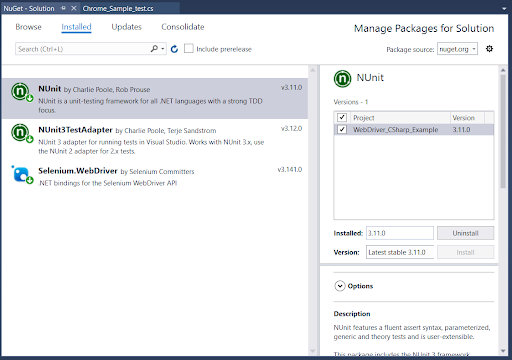 NuGet pulls dependencies like WebDriver from central repositories and adds them to your project. You’ll need an internet connection to proceed. Right-click the project, then select Manage NuGet Packages. In the package management screen, first click “Browse” in the top left (instead of looking at installed package.) Then search for WebDriver. As of this writing, you will find a wide variety of packages with similar names. Some of them support Webdriver2 and others WebDriver3. Today you will install Selenium.Webdriver, Nunit3 and the NUnit3 Test Adapter. The version number of the Selenium Webdriver should be at 3.x, as of today the version is 3.141.0. If the version is a double-digit number or 2.X, then it will be incompatible. If you wish to use other browsers such as Internet Explorer or FireFox, then you’ll need to install those drivers as well. Note for Internet Explorer, you can download the packages in NuGet and skip installing an intermediate executable. WebDriver doesn’t know how to do anything other than talk to the browser driver. As a result, you’ll need some sort of test framework to execute your tests, make assertions, and report test status. We’ll use NUnit, which is popular, free, and easy to learn and use. 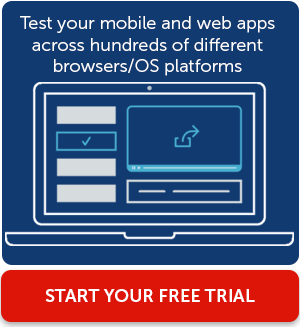 There are many other test frameworks for the .NET platform. NUnit test cases are nothing more than class files added to the Visual Studio class library project. You can rename the initial “Class1.cs” file added to the project by default, or you can add another complete class by right-clicking the project and selecting Add Class. When you first create or open a project, Visual Studio doesn’t know what tests are in it. You need to first populate the list of tests. Do this by opening Visual Studio’s Test Explorer via Tests => Windows => Test Explorer. Select Run All Tests to build the project then automatically discover and run all tests—in this case, one. You’ll see (hopefully!) a green test in the Explorer window which means your test passed. In this post you learned a bit about the different versions of Visual Studio, where to find the free Community version, how to create a basic project and add the various WebDriver pieces necessary for C# WebDriver tests, and we showed you an end-to-end test.